Oscar Wilde once wrote, “It is through art and through art only, that we can realize our perfection.” Reba Sochis is the personification of Wilde’s statement. Born in Philadelphia, Pennsylvania, Reba Sochis grew up expecting to follow in her sister’s footsteps: go to university and study to become a teacher—certainly the proper profession for a proper young lady and most acceptable to our country’s social attitudes at the time. Always interested in art, Sochis, however, saw her future develop differently. Not wanting to be confined to a classroom, she convinced her parents to allow her to enroll in the Philadelphia Museum School of Art. The year was 1929. The country was about to be thrown into the depths of a great depression. Fortunately, Alexey Brodovitch had just joined the school’s faculty. He was to be a great influence in her approach to graphic design. His teaching methods were as unique as he was. Brodovitch did not dwell on technique, focusing instead on the philosophy of design. According to Sochis, “The more he tried to provoke his students, the harder we worked,” a character trait many an assistant would also lovingly attribute to Reba Sochis. By 1934, she moved with her husband to New York City. In the midst of the Depression, to supplement their income, Sochis freelanced as a designer, creating various book jackets for small publishing houses. She eventually landed her first job in editorial layout design at Esquire Magazine, where she recalls being given the opportunity to experiment and take risks. After Esquire, Sochis headed for Charm Magazine. By the end of World War II, she was hired as an art director for a large design firm in New York called Beacon Studio. Sochis resumed her career in what was, with the exception of her only female counterpart Cipe Pineles Burtin, then art director at Seventeen Magazine, the unchartered world of women in design. She was the only woman responsible for a staff of over twenty men. Sochis looks back on her pioneering days at Beacon as being a “jewel of a job.” She attributes this to the fact that she never looked upon herself as a threat to the men and their jobs. Sensing this, they quickly accepted Sochis for her talent. She immediately became one of the boys without ever having to sacrifice her femininity. As long as her high standards of work were not compromised, there were no wrinkles at Beacon Studio. One of Beacon’s biggest accounts was Talon Zippers. Quite pleased with Sochis’s elegant work for their promotional pieces, the client encouraged her to open her own studio. Late in 1949, Reba Sochis ventured out on her own with Talon as her first and only account. Because of the plethora of promotional materials Talon required, Sochis was swamped with work. She needed to hire a talented assistant and fast! Her first full time employee was a 19 year-old Pratt junior named George Lois. Lasting over 40 years, the mutual love and admiration both still have for each other is steadfast. 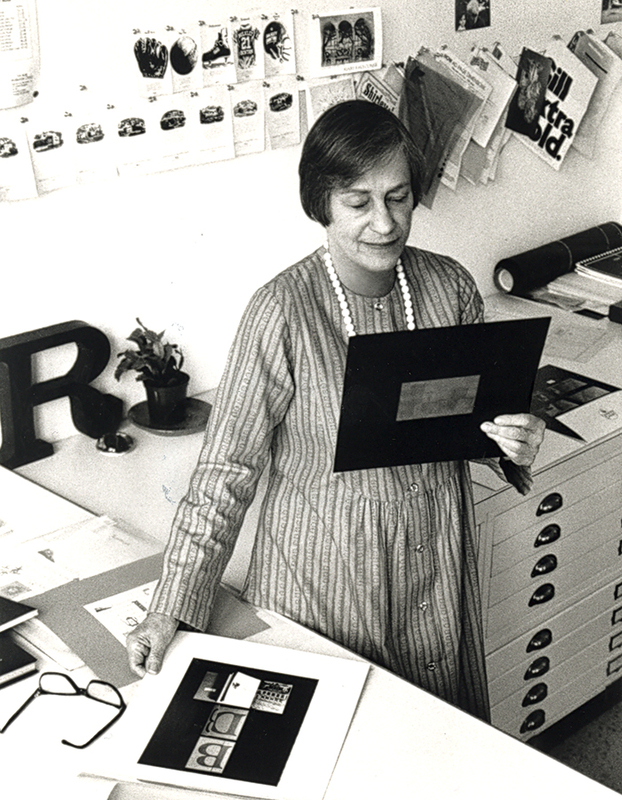 As Sochis’s reputation for quality design grew, so did her studio, necessitating the hiring of more assistants. She turned it into a wonderful greenhouse of talent, recruiting Pratt and Cooper students as full- and part-time assistants. Among those who benefited from Sochis’s tutelage, eventually moving on to outstanding careers in their own right, were: Seymour Chwast, Bob Gill, Kit Hinrichs, Steve Horn, Andrew Langer, Gilbert Lesser, Rick Levine, Tony Palladino, Tony Russell and Bob Tucker. The work Reba Sochis turned out from her atelier was flawless and the envy of conceptual designers. Her list of satisfied clients was a tribute to her professionalism. Sochis’s work for Talon, Borghese, Bulkley Dunton, Lincoln Center, New York Telephone, Pappagallo, Revlon, JP Stevens and Shell Oil are marvels of detail and fine design. A case in point was a shopping bag she produced for the newly launched Pappagallo shoe stores. In order to achieve the visual look of an intricate mosaic pattern, Sochis and her assistant, Andrew Langer, literally cut thousands of small tile-like pieces from sheets of gold paper. Each had to be positioned onto a mechanical with a tweezer! It took them weeks to complete the project, but the end result was a striking work of art. For a Lincoln Center corporate fundraising brochure, Sochis decided to use safety paper, more commonly referred to as checkbook paper. Indeed, a very subtle, yet effective method of getting people in the mood to donate money. More often than not, her incredible work was also the result of time being on her side. The majority of her jobs did not require deadline-insertions; thus, if Sochis was not pleased with a particular design, it was completely scrapped and redone from scratch. At one point, she was asked to teach at Pratt. Sochis never realized how much she disliked teaching until actually setting foot in a classroom. After one semester, Sochis left Pratt, preferring instead to instruct eager young assistants from the comforts of her own studio. Today, Reba Sochis is active in design, advertising and promotion. She selectively works on a wide variety of challenging projects. Reba Sochis readily admits to being a demanding taskmaster. But it’s done out of a deep-rooted love and respect for her craft. In an era of computer-generated design amidst a get-it-done-yesterday world, it’s comforting to know that there are people like Reba Sochis. As long as she still cares, that twinkle in her eyes will continue to light up the design world. Please note: Content of biography is presented here as it was published in 1990.